What material is the cover of Olives diary notebook? ☆ The cover of the notebook is made of a kind of precious silk called China brocade. Having it in your study and work highlights your dignity.Meanwhile,the size of the perfect design, make it more easy to carry around in your purse or bag. ☆ China brocade is famous for its color and beauty. It is well known of its fine materials and weaving, exquisite patterns, beautiful cotton and elegant style. Based on the inheritance of the excellent traditions of the brocades in the past, it has accumulated valuable experience in other silk weaving techniques, create a higher achievement in silk weaving, and condensed the essence of Chinese silk weaving skills. It is the crystallization of Chinese silk culture. ☆ Chinese Style Design:The Chinese Journal Notebook cover of traditional Chinese elements design,printing Chinese dragon inside pages,inner paper is college ruled ,with Chinese ancient money bookmark belt. ☆ Unique Silk Dsign:Silk hardcover writing notebook handcrafted by trained craftsmen.This Chinese notebook can record all your daily journal routine stuff.Used in offices,schools,classrooms,traps,travel. ☆ High Quality Paper:The paper that comes with it is also high quality and very durable! Its nice and thick and you can use anything from pencils, pens, markers, and nothing will bleed through this. 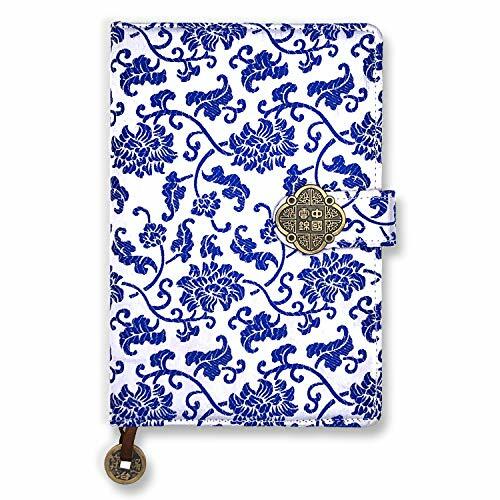 ☆ Noble Gift:It is exquisite Chinese style design ,good gift for Mother's Day, Father's Day, Christmas, Anniversary, Birthday, Back to School or Graduation writing journal. ☆ Quantity of paper:120 Pages/60 Sheets. ☆ Refills Size: 8.3*5.5*0.4INCH/A5 Size. ☆ We offer the lifetime warranty.100 % Satisfaction Guaranteed.